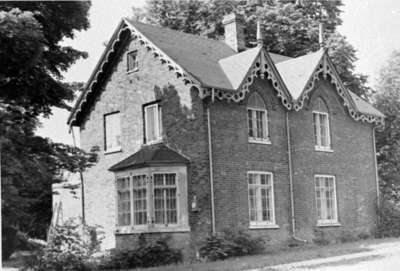 Black and white negative showing the former residence of Charles Barton at 219 Keith Street. This house was built in 1857 by James Wallace as quarters for the officers of the Whitby Highland Rifle Company. It later became the home of Robert Wilson, a local lawyer. From the 1880s until 1974, the house was owned by the Barton family. Residence of Charles Barton, 1975, Brian Winter, Whitby Archives, 17-046-002.